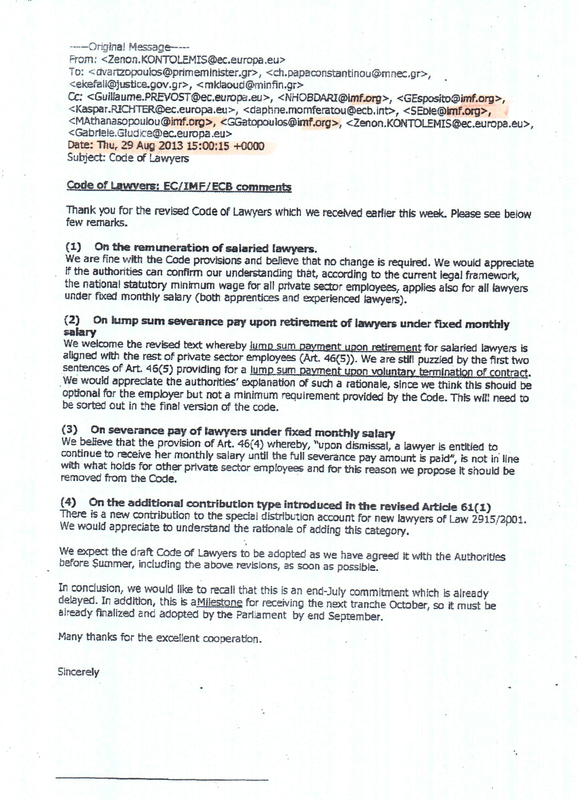 An email obtained by UNFOLLOW magazine appears to contradict the Greek Government’s claims that their proposed bill regarding the Code of Lawyers in Greece is absolutely “their own initiative” and not a troika “demand”. According to the email, Mr Zenon Kontolemis, a troika-appointed “supervisor”, is addressing pressing requests to the Greek government for “revisions” in the bill, and threatens that, if Greek legislators fail to heed his demands, the sum of loan money Greece is expecting in October will not be disbursed. During current discussions of the proposed law regarding the Code of Lawyers in the Standing Parliamentary Committee on Public Administration, Public Order and Justice, the Minister of Justice was asked whether there were pressures to implement specific changes to the bill or to speed up the process. The Minister replied that the bill was the Government’s initiative and that there was no “expediting factor”. This is of course in line with overall Government rhetoric that its “reforms” –a euphemism for austerity measures– are no longer dictated by the troika, but by Greece’s own need for “change”. Nevertheless, the email addressed by Mr Kontolemis to the Greek government contradicts the Justice Minister’s claims: it not only requests that “revisions” be made to the proposed bill, an issue of domestic policy, but it also reminds the government that they have already committed to making these changes in July, and it also demands the legislature’s swift actions, under the threat that the October payment will be withheld. “We expect,” writes Mr Kontolemis, “the draft Code of Lawyers to be adopted as we have agreed it with the Authorities before Summer, including the above revisions, as soon as possible. In conclusion, we would like to recall that this is an end-July commitment which is already delayed. In addition, this is a Milestone for receiving the next tranche October, so it must be already finalized and adopted by the Parliament by end September”. The email is addressed to, among others, Mr Dimitris Vartzopoulos, General Coordinator for the Greek Government, officials in both the Ministries of Justice and Finance, as well as officials in the IMF, the European Commission and the European Central Bank. The Minister of Justice shrugged the email off, saying that it was merely an exchange of “opinions”. Yesterday, after UNFOLLOW magazine had published the email on its website the previous evening, during the deliberations of the Standing Committee, the Minister of Justice Mr Charalampos Athanassiou was challenged once again by Ms Zoe Konstantopoulou, a SYRIZA (Main Opposition) MP, on his alleged “independence” from the troika. He shrugged the email off, saying that it was merely an exchange of “opinions”, and failed to address the fact that in the email a demand is made of the Greek legislature, a distinct power in a democracy, as a condition for the payout of the next “tranche”. Throughout the years of the Greek crisis, those who insist that the various agreements with the troika –collectively dubbed “memoranda”– effectively mean a loss of sovereignty are systematically vilified. It does not matter that it is not only the nationalists or the extreme-right who voice such concerns– nor does it matter that, in any case, traditional political divides in Greece have been completely jumbled, with a pro-troika government made up of populist and nationalist rightists and far-rightists, together with socialist “modernizers” and centre-left former leftist “revisionists”. In fact, concerns over the loss of national sovereignty have been expressed by the moderate leftist opposition party SYRIZA, but these were also met with accusations of nothing less than “nationalism,” particularly by the centrist component of the coalition government. The point of course that is being made by those fearful of the troika’s complete hold over Greek domestic policy is not about abstract national pride, but about the erosion of the democratic process, where citizens are no longer governed by those they have elected, and those who hold elected office are no longer bound by democratic accountability.